This week we will be checking out a newly discovered creature that is one of the oldest known pterosaurs to date. Let's check out Caelestiventus hanseni! Caelestiventus lived in what is now Utah, USA, during the late Triassic period, about 208 million years ago. It was a meat-eater, and based on the bones that have been found, would have had a wingspan of almost five feet. The genus name, Caelestiventus, translates to "heavenly wind" and the species name, hanseni, is in honor of geologist, Robin Hansen. 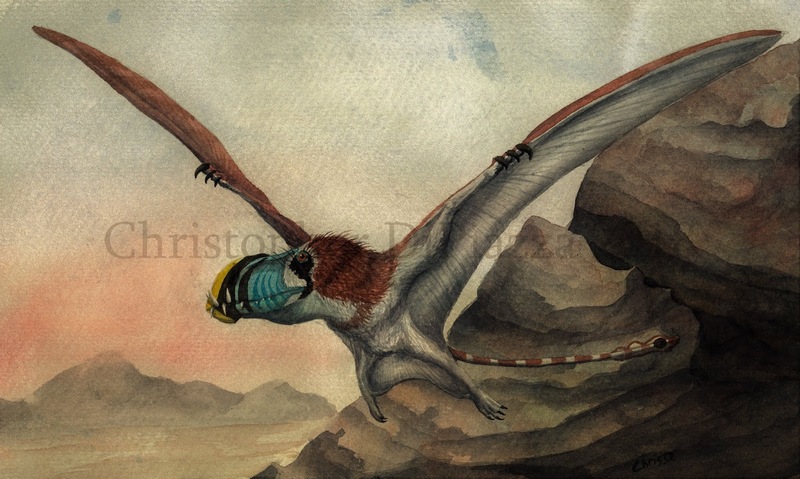 Life reconstruction of Caelestiventus in watercolors by me. Caelestiventus is particularly amazing because it is the oldest known pterosaur from North America. On top of this, it lived in an arid, desert-like environment, which is not common in currently-known pterosaurs. Even more amazing is that the bones from Caelestiventus are beautifully preserved in three dimensions. Most pterosaur bones tend to become flattened during the fossilization process because they are so delicate. The fact that Caelestiventus preserved as well as it did allowed paleontologists to get a better idea of the shape of he skull. 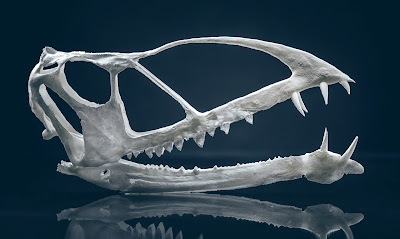 According to what was found, Caelestiventus would have had powerful jaws, due to ridge-like structures on the top of its skull where muscles would have attached in life. Since paleontologists were able to scan the inside of the skull, including the space its brain occupied, they found that its eyesight would have been powerful, but the senses of smell and taste less so. 3D printed cast of Caelestiventus' skull. This pterosaur is known from an almost complete skull and a piece of the wing. Caelestiventus was a very close relative of the more famous, and slightly later-living pterosaur, Dimorphodon. Both of these pterosaurs had proportionally gigantic skulls that were tall and armed with differentiating kinds of teeth, which is also unusual among known pterosaurs, let alone reptiles in general. Caelestiventus, specifically had long, pointed teeth in the front of its jaws, which would have been ideal for capturing prey, and smaller, more blade-like teeth in the back of its jaws, which appear to have been more for processing food once in the mouth. Exactly what Caelestiventus was eating is still mostly a mystery, but we do know there were a number of small reptiles, like sphenodonts (relaitves of modern tuataras), pseudosuchians (relatives of modern crocodilians), and even some dinosaurs, that at least as babies, could have been food items for this pterosaur. There were almost certainly a variety of insects alive back then, as well, that could have been a staple food source for Caelestiventus. Britt, B. B.; Dalla Vecchia, F. M.; Chure, D. J.; Engelmann, G. F.; Whiting, M. F.; Scheetz, R. D. (2018). "Caelestiventus hanseni gen. et sp. nov. extends the desert-dwelling pterosaur record back 65 million years". Nature Ecology & Evolution. Britt, B. B.; Chure, D. J.; Engelmann, G. F.; Shumway, J. D. (2016). "Rise of the erg—Paleontology and paleoenvironments of the Triassic-Jurassic transition in Northeastern Utah". Geology of the Intermountain West. 3: 1–32.